supermarket | Have kids, they said. It'll be fun, they said. Supermarkets. And why I’d rather poke my eye out with a stick. I used to love grocery shopping. Pre kids, that is. Choosing what to have for dinner, for lunch. Buying ingredients for new recipes I’m just itching to try. A calm, quiet meander through the aisles. Now, I would rather poke my eye out with a stick. I really drag my feet with grocery shopping, leaving it until the Last Possible Moment. Inevitably, the Last Possible Moment often coincides with Mr T being at work. Sigh. And so we have, The Supermarket. Getting to the supermarket is easy. Get in the car and go. When we arrive, the first challenge is finding the right trolley for the job. BoyChild is right on the maximum weight limit for the double trolleys (the ones that seat two preschoolers) but that is my best option when shopping with the kids. I mean, having a 4-year-old loose in the supermarket is one thing, having a 3-AND-4-year-old loose? That’s a whole ‘nother kettle of fish. Of course, without fail, one of only two double trollies in the entire supermarket will be at the back of a line of, oh, 5 million trollies. 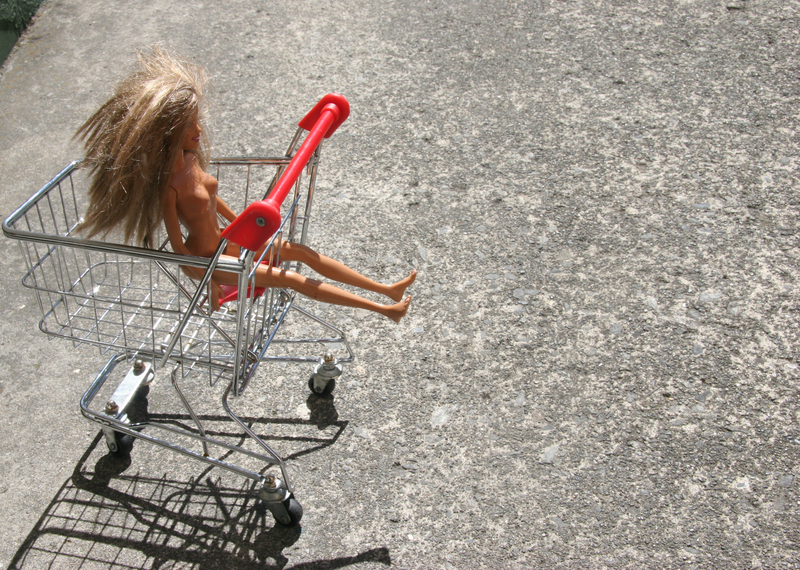 I leave the kids in the car until I have my hands on my trolley. I tried getting the kids out first and that is just asking for trouble – I lose one kid behind the Lotto counter and another under a line of trollies. Anyway, after my mission of moving 5 million trollies (and finding somewhere to put them all), all the while dodging other people getting trollies (and them thinking that I’m getting them out for them – thanks, love, but I’d prefer the next one in the line. Um, take what you are given, thankyouverymuch), I finally get the double trolley. And now I have to line all the trollies back up again. I stopped working in a supermarket when I was 17, I really didn’t see myself stacking trollies again in my lifetime. At least back then I got my whopping $6.50 an hour for the job. I take the trolley to the car and load the kids. It’s a real talent, negotiating a 3 year old into the tiny trolley seats. Thank heavens for seatbelts in those things, at least once I finally wrestle the kids in, they aren’t going anywhere. The person who invented trolley seatbelts to do up at the back is a genius and I take my hat off to them. And, now we shop. I think the real difficulty with supermarket shopping is the juggling between kids, “I wants” and trying to stretch (this much) money into (THIS MANY) groceries. The fruit and vege section is first and it’s not that thrilling for the kids, not surprisingly. Except Princess – “Mum! Let’s get mushrooms. I love mushrooms. Let’s get oranges. I love oranges. Let’s get abo-cado. I love abo-cado. Let’s get … ” . Next section, meat. Accompanied by the commentary, “Yuk. That meat is red. Yuk. That meat is brown. Yuk. That meat looks like poos”. So far so good, though. This trip is going to be a breeze. Skip the alcohol aisle entirely. Because, well .. let’s be honest. The temptation to buy a bottle of cider and two bottles of Sav instead of strawberry milk is there. Plus, it’s an aisle full of glass bottles. Three preschoolers + glass bottles = an expensive lesson. The next aisle is confectionary, magazines and dvds. All in one aisle? Really, Mr Supermarket? That’s our loudest aisle, I think. “MUM! CAN I GET THIS BAG OF LOLLIES?! MUM!! CAN I PLEEEEEASE HAVE THIS PRINCESS MAGAZINE???? OH MUM WOW LOOK! A TINKERBELL DVD!!! WOW”. Add to that Master Sneaky McReachy who somehow manages to open and be eating a kinder surprise before I’ve even realised I stopped the trolley near the stand. I use the term “open” loosely, he tends to just bite into it, foil and all. I think it’s about this stage that the kids are getting over the excitement of being in a store full of boxes and containers that they clearly aren’t allowed to touch. Luckily we reach the deli. I buy luncheon every time I go to the supermarket. Not because I like it, or because we need it. I buy it so I get given the free piece for each kid. I have tried loitering around the deli until they offer my kids a piece of luncheon but it never works – I just look like the weird lady loitering at the deli. Of course, you get the occassional deli person who doesn’t offer the kids a piece to eat, even when you do buy some. I do not like those people. Don’t they know how quiet it keeps my kids?! It’s for everyone’s benefit, really. On that note, I did try bringing my own snacks to the supermarket but they were never eaten. I also went through a phase of opening a box of crackers mid-way around and feeding them to the kids, but Mr T got concerned that I would be done for shoplifting and who would look after the kids while I was in prison? Anyway, luncheon-stuffed kids galore, we go to the aisles with canned goods, noodles (“NOODLESNOODLESNOODLESNOODLESNOODLES”), walk very fast past the food colourings and sprinkles in the baking goods aisle (“I want sprinkles Mum. Hey, Mum – these are on special! Let’s bake a hundred cakes for my birthday!) and walk equally fast down the feminine products aisle (“Are they for your BUM BUM Mum? Are they grown up lady nappies, Mum?”). It is in the nappy aisle that the kids are really starting to get bored and restless, but it’s also my calculator aisle. Yup, I’m that person who stands blocking the aisle while I get out my phone calculator and work out which packet of nappies is cheapest that week, based on price per nappy. If I’m spending $30+ on nappies per week, I’m going to get the best deal, dammit! We skip the pet food aisle as we don’t have a pet (“MUM! Can we get a dog PLEASE? Can we buy cat food for Grandma’s cat PLEASE?). And lastly, the fridges. “It’s COLD here, MUM” “Well, don’t put your head in the fridge, love”. Milk, bread, eggs, yoghurt (put at the BACK of the trolley, learned that one the hard way, a la Sneaky McReachy again). Strawberry milk. A little strawberry milk for each kid to have when we are finished. Justification for my own treat, in all honesty. Walk briskly past the shelf of toys (“No, BoyChild, you don’t need an infrared T-Rex. Please put it back on the shelf”) and find a check out. Try to ignore the looks of “Oh dear lord, please don’t let her come down my aisle” while also struggling to push the trolley with one hand (because trollies seem to list to the right when they are full), grasping Princess’s wrist with the other hand (because she has to go and look at the chippies/lollies/biscuits once more) and making peek-a-boo faces to Baby Girl who has been elbowed by BoyChild one time too many in the trolley and is just whining and whining for a cuddle now. Get to the check out, ask the person to scan the strawberry milk first then send the two older kids to sit down quietly while I scan and pay for the groceries. Juggle the groceries and the children to the car (if I’m really lucky, it has started to rain by this point), put the older two into the car and then unpack the bags into the boot. Put the baby into her seat and then return the trolley to the closest trolley bay (which is never close). Get into the car to three screaming kids, rest my head on the steering wheel and thank goodness that I am done for another week. And then realise I’ve forgotten the key ingredient for dinner. And I’ve forgotten my own treat. I just … it just … I should try online shopping. Except I need to concentrate for an hour to properly do it, last time I tried the kids distracted me and we ended up with five tins of tomatoes and three packs of M&Ms but no bread or milk. Next time, I will go alone, very late at night.